209 New Jersey Avenue, N. E.
As the oldest school of bartending and mixology school in Maryland, MBA is recognized and respected by the people who matter the most : the people who hire bartenders. Founded in 1980, Maryland Bartending Academy takes a real-world, hands-on approach to bartending, giving you the skills and confidence you'll need to start work right away. Our Baltimore school has a state-of-the-art classroom that allows our studetns to experience exactly what it feels like to work behind a completely functional bar. The modern and up to date equipment at our school helps the students build the confidence and knowledge they need to begin their new career as a professional bartender. 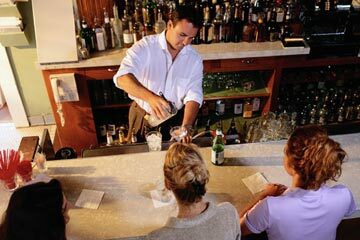 The Maryland Bartending Academy's teachers are experienced bartenders and educators. We have used our many years of experience to ensure that our teachers provide the highest quality instruction, drawing from their own real-world experience. Best of all, the experienced teachers at our school make the learning fun! The MBA is an active member in good standing with the Better Business Bureau. The MBA meets or exceeds all requirements set forth by the Maryland Higher Education Commission for schools and is fully approved. The Maryland Bartending Academy is a member of the International Association of Bartending Institutes, and a member of the Professional Bartending Advisory Board. Take the time to check out all of our pages on our Baltimore bartending school and then TAKE THE NEXT STEP! Request more information on our school or call us today and we will show you how we can help you get started in your new bartending career!